When new people I meet discovers I lived in Japan for more than two years, many ask “You must have had a hard time with the culture shock”. It was a bit troublesome sometimes, but I adapted pretty fast. The problem was when I came back to Barcelona. I had a hard time with the reverse culture shock, and many times I find myself comparing how things are done here, and what I consider “flaws in the system”. This is the greatest deal of all. In most of the streets of Tokyo, smoking is banned. You can walk breathing “fresh” city air, without worries of other’s second hand smoke, or even get burned with their cigarettes. They have their “smoking areas” prepared for that. Now I have to avoid walking near any smoker on the streets. Or going out of a building through a smoke curtain on the doors, because ashtrays are next to the doors. The first thing you breath on the street, good lung problems. On the other hand, is allowed to smoke in bars, izakaya, karaoke, and some restaurants in Japan. Going out with your friends to have a drink in Tokyo when you’re a non smoker can be troublesome. Even if the whole group of friends doesn’t smoke, if you get a karaoke room that has been used previously by smokers is quite a problem. No windows and the air conditioning doesn’t help to clean the air. Still, it’s your choice to go or not and avoid the smoke places. Walking on the streets is not a choice. 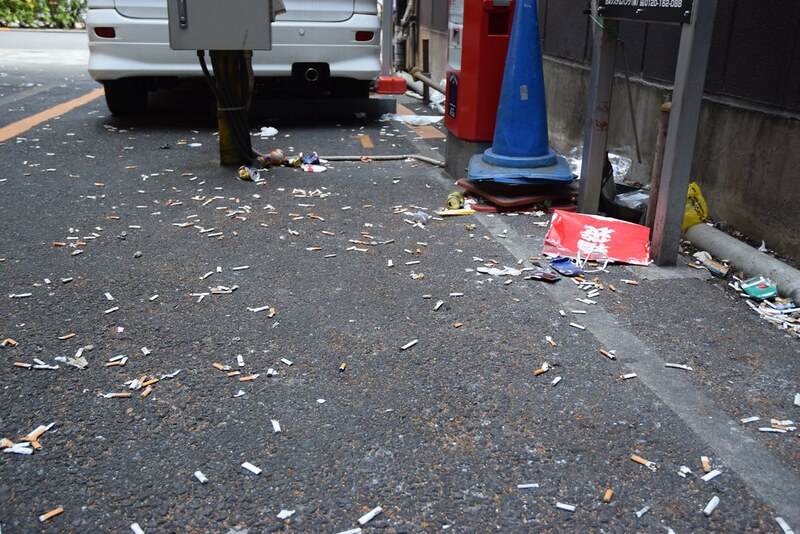 This photo was taken minutes after a large group of tourists stopped in the area in the streets of Tokyo. Many people that visited Japan said to me that service is cold. They have ticket machines in the front of restaurants and the staff barely talks to you. 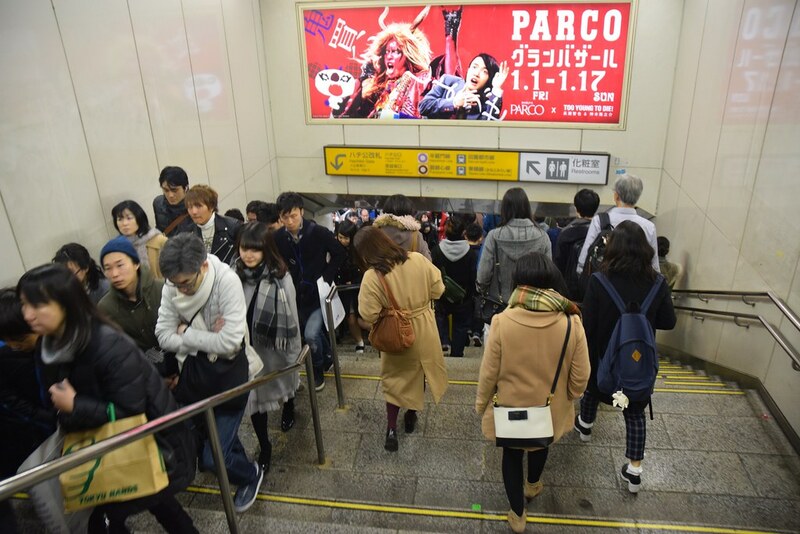 That’s the language barrier problem for many Japanese attending tourists. And the tourist point of view. Never happened to me in Japan I had to wait more than 5 minutes to be attended after taking seat in a bar or restaurant. Now in Barcelona it seems that 10 to 15 minutes is a normal “waiting time” to get the attention to come to the table, and seems more like you’re bothering them. (Not everywhere). And I’m not a tourist. In Japan, they welcome every single client coming into the restaurant, and thanks them on their way out after the service. Because yes, japanese toilet are awesome, nothing like cold winter morning and you sit on a warm toilet lid….. just brilliant. Also, public toilets are so clean there’s nothing to worry, in other countries, public toilets are just a NO WAY. Need some music to hide your bowel movement sounds? You got it. 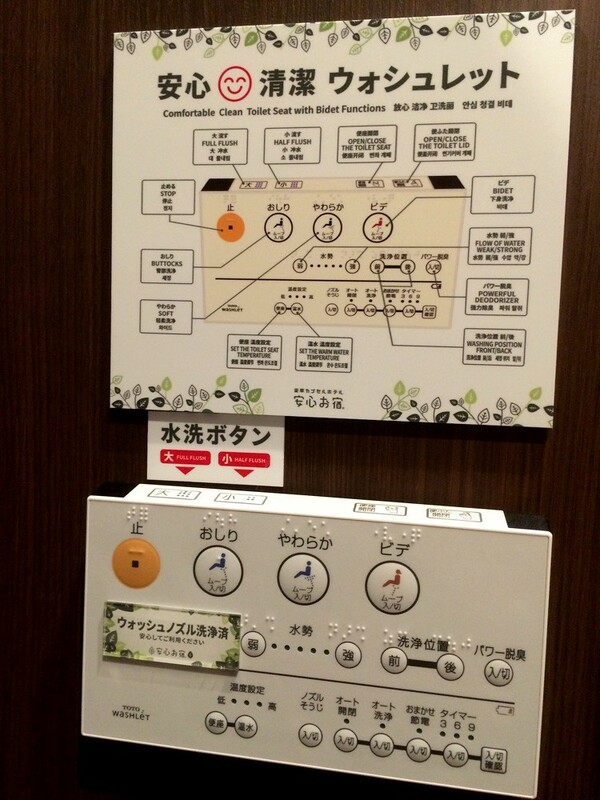 Comfortable and clean toilet seat, only in Japan. Convinience stores: THIS is necessary in my life, the comfort of being able to buy at any time, any day, it’s just fantastic. What if I want to buy something after midnight on my way home? not possible anymore that I live in Barcelona. Also, doing groceries in the market around 7-8PM and you will find a lot of discount prices. 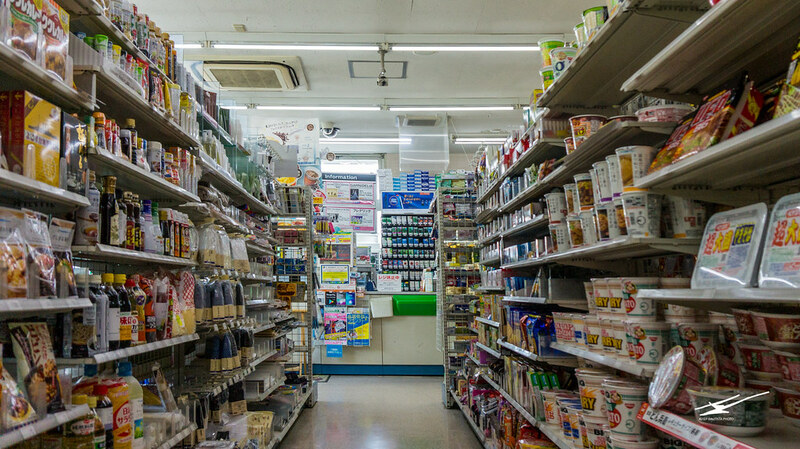 Convinience stores “Konbini” in Japan. Life savers. 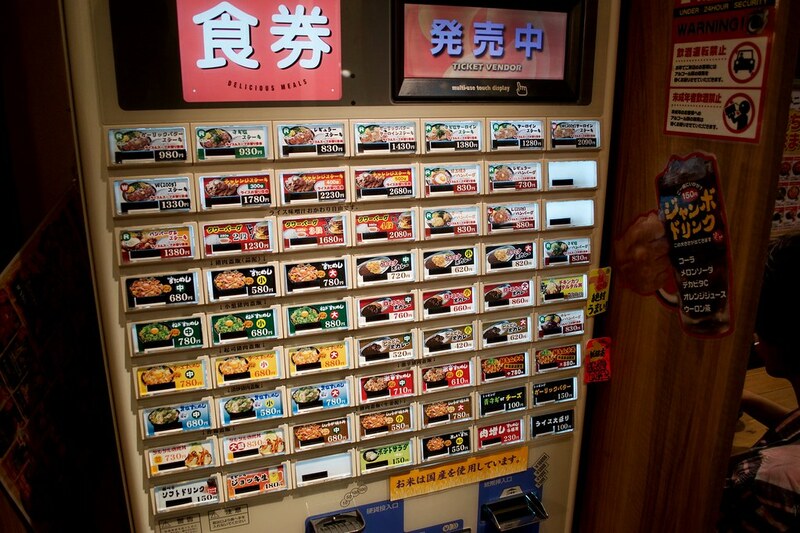 Vending machines. Never thought I could miss those vending machines every 50 metres on the street. Now if I walk I have to enter either any supermarket or shop to buy drinks and waste time. No litter or any trash on the streets, except for early mornings on trash collecting day. Or that how it used to be. In the biggest tourist areas it has become more of a problem to keep the streets clean on rush tourist hours. Recicling your trash in Japan is important. 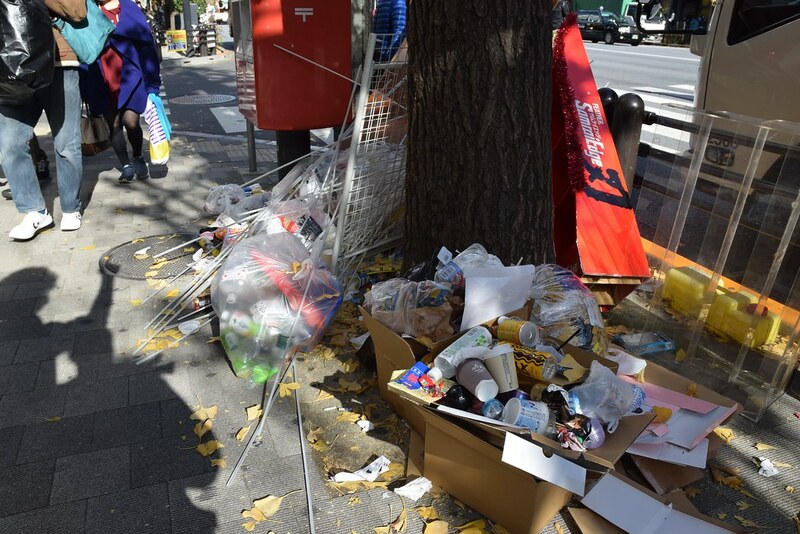 Trash collecting day in hot tourist spots end up having “undesired” trash piling up. Here’s where the lack of discipline and education comes. I barely use the public transport in Barcelona. People getting in front of you to get ahead on entering the metro. People talking loudly over the phone. People using their phones as a stereo with music. Trash almost everywhere on the ground and the tracks. People trying to get inside the metro, before you get out. In Tokyo, everybody respects the order, and it’s simple. It’s all about respect to the others and your surroundings. Understanding all the subway and train lines system of Tokyo, complicated.